In part two of this series on running away, James tells you how to handle it when your child is on the streets, and what to say when they come home—including giving them consequences for their actions. For kids, running away is like taking a long, dangerous timeout. They may use it to avoid some difficulty at home, or to hide from something that’s embarrassing to them. You can also look at running away as a power struggle, because kids will often run instead of taking responsibility for their actions or complying with house rules. Above all, as a parent, what you don’t want to do is give it power. That’s the cardinal rule: do not give this behavior power. The forces that drive your child to run are more powerful than the thought that he might get a consequence. In the last article, I discussed what you can do before your child leaves, and how to create an atmosphere of acceptance at home. In part two, I’d like to talk about what you can do when your child is out on the streets, and how you should handle their re-entry back into home life. If your child has run away, you need to call the police, plain and simple. 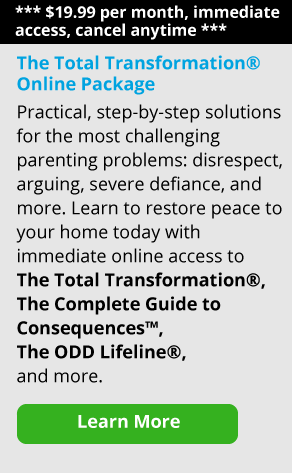 I understand that not all parents want to do this, but I think it’s imperative that you take this step. I can’t stress this enough: you want to have a written record that your child is not under your supervision, and that should be recorded at the police station. Also, if you call and report your child missing, know that your call will be recorded. I hate to say it, but one of the paradoxes for parents is that the authorities will often ask, “Why did you let your child run away?” when in fact, there’s no way they can make them stay at home. Do your best to answer as honestly as you can, because it’s very important to document what’s happening. You should also call the Department of Human Services to create a paper trail there, too. They may very well tell you that they can’t give you any help, but the point is, you documented it. Be sure to write down the name of the case worker you talked to for future reference. Should You Look for Your Child on the Streets? There are those parents who look for their kids to make sure they’re okay. I understand that impulse, but again, I don’t think you want to give your child too much power or special status when they run away. If they get too much attention and too much power, you’re just encouraging them to do it again the next time there’s a problem. Unintentional reinforcement is something you have to be very careful about. If you do find your child, you can say, “Look, when you’re ready to come home, we’ll talk about it.” I’m personally very leery about parents who chase after their kids and beg and plead. If you do beg them to come home, when your child comes back, they will have more power and you have less. From then on, whenever they want something or don’t want to be held accountable for their actions, they’ll play the runaway card. In the states where I’ve lived, if your child runs away and you call the police, by law they can’t do anything. Part of the obstacle that parents face is a lack of community support. Amazingly, there’s no statute that requires kids to live in a safe place. That really puts parents in a bad place because society won’t make your child stay at home or even in a shelter. When I was a kid, if you ran away from home they would take you to court and put you on probation; you were simply not allowed to run the streets and be a delinquent. Unfortunately, that law has changed. Today, it’s estimated that there are between one to three million kids on the street in this country. If you decide to file a Missing Persons report, even if the police find your child living on the street, they can’t make him come home. Now your child is no longer a “Missing Person,” and you have even less power in some ways. When that happens, you just have to wait until your child wants to come home. If your child has dropped out of school and is abusing substances and living on the streets, I don’t think they should be allowed to come home without certain conditions. And if it’s decided that they can return, their re-entry to home life should be very structured. I know it’s hard, but I think that even if your child is crying on the phone, what you want to get clear is, “We love you very much and you can come back again, but the rules aren’t changing.” I’ve seen parents with abusive kids tell them very simply, “You can’t come home until we have a meeting and agree to some rules. And until then, stay with your friends.” It’s difficult for parents to do, but I support that. One of the main things you want to talk to your returning child about is what they’re going to do differently this time. Ask, “What’s going to be different about the way you solve your problems, and what are you going to do the next time you want to run away?” I recommend that you have a frank discussion with them. Let them know that running away is a problem that simply complicates their lives and makes their other problems worse. Again, we want running away to be viewed as a problem your child has to learn to deal with. We know as adults that once you start running from something, you may run for the rest of your life. Running away is one of the ways kids solve problems, it’s just not an effective way to do so. And in fact, most solutions that depend upon power and control are ineffective. If your child has run away to avoid consequences, he should do them when he comes back—immediately. That’s what he ran away from, and that’s what he needs to face. Running away is a very dangerous and risky behavior, and I believe there should be a consequence for it, as well. The consequence doesn’t have to be too punitive; keep it task-oriented. One of the problems with consequences is that if they’re not lesson-oriented, then the concept you’re trying to teach is lost. I like a consequence that says, “Write out the whole story of how you ran away. What were you thinking, what were you trying to accomplish? And then tell me what you’re going to do differently next time.” Sit down with your child and get them to process it with you, and then talk about what your child can do differently next time together. Always hold them accountable. For kids who run away chronically, if you send them to their room, they won’t learn anything. But if you ground them from electronics until they write an essay, make amends, and tell you how they’re going to handle it differently, eventually the behavior will change. Here’s the truth: nobody ever stopped running away because they were afraid of punishment. Nobody ever said, “I’m not going to run away because the consequences are too severe.” If you’re a parent of teen who is in danger of running away, realize that the forces that drive him to run are more powerful than the thought that he might get a consequence. If your child writes an essay about why they ran away and tells you they are sorry, whether they mean it or not really doesn’t matter. The important thing is that the learning is going to change. Think of it this way: if you had a spelling test every day, whether you tried or not, you’re going to learn to spell. It’s the same way for your child—he has to write those words out. One of the primary ways kids learn is through repetition and rehearsal. Part of that, by the way, is giving them task-oriented consequences, over and over again. It’s much better to have your child write an apology five times than to send them to their room for five hours. Eventually, that learning will sink in—I’ve seen it happen time and time again. Should You Ever Tell Your Child to Leave? Sometimes kids come home and start falling into their old patterns of behavior. I know parents who have told their kids to go to a shelter or to go couch surf for a week. I am sympathetic to this approach, but I think there’s a very high risk involved; each family has to make decisions like these very seriously. If you’re going to tell an under-age person to go couch surf, you have to think that through carefully. This is not because you’re going to be held criminally responsible or go to jail, but because bad things can happen—and you’re going to have to live with the consequences, no matter what. Parents of girls often worry more because of the simple fact that it’s riskier for girls to run than for boys—more harm can come to them. Remember, each family has to live with its own decisions when it comes to safety—and there’s no joking about that. In my opinion, the key to dealing with kids who run away both chronically and episodically is teaching them problem-solving skills, and identifying the triggers that lead to risky decisions. Kids have to learn coping skills that help them manage their responsibilities in the here and now, so they don’t have anything to run away from in the future. That means doing their homework and chores, being honest and not lying about responsibilities and schoolwork, getting clean and sober if they have a substance abuse problem, and being able to face the music when they’ve done something wrong or publicly embarrassing. The bottom line is that kids need to learn how to take responsibility, be accountable, and not run away from consequences. Kids are not told enough that life is what you make it—and that means now, not when you’re 25.